I am honored to be a guest composer with Random Access Music composer’s collective this season, on a concert of new music for the viol consort Parthenia : “Prisms: Ancient Courses in a New Light”. I was invited to write a new composition for the consort, and was delighted to be given the opportunity to work again with these fantastic musicians! My new piece, From a fairy tale, is accompanied by a text by James Pritchett, which will be narrated by Valeria Vasilevski. To read more about the text, and to hear Valeria read it, visit James’ blog post. Parthenia is presenting this concert twice, on Friday November 8 and Saturday November 9. I’m excited about the upcoming 2013 Ussachevsky Memorial Festival at Pomona College in Claremont, CA (near Los Angeles) where I’ll be guest composer this year. What makes it particularly nice is that my husband James Pritchett, writer and expert on the music of John Cage, will also be a guest at the festival! There will be performances of several of my pieces, and James and I will be giving a lecture about our work. For more information, visit the Pomona music department calendar. In particular I wanted to mention that violist Cynthia Fogg will be playing my The book of roses and memory. Here’s a link to a video of her beautiful performance of my A veil barely seen at last year’s festival. Enjoy! I’m delighted to announce that I received an award from Commissioning Music USA to create a new work in collaboration with the brilliant artist Karen LaMonte. Music for emptiness/music for empty chairs will be a 20 minute work for flute, viola, electronic sound, and video. Karen describes the video: “The objective is to create a visual experience that parallels the phenomena of echo and sound as it travels toward silence.” In the music, I will attempt to embody these phenomena as expressed by the visuals. The empty chairs suggest absence, and their disintegration the inevitability of loss. The musical language will start with the human, emotional experience of loss, and gradually erase that into silence. In particular, I will explore the nature of sonic decay – what Morton Feldman called “this departing landscape.” Thus the starting point for the piece is the idea of transformation: sound disappearing into silence, form into abstraction, longing into emptiness. Music for emptiness/music for empty chairs is commissioned by The New York Viola Society. The NYVS will present the premiere in late 2013 or early ’14. I’d also like to thank The Classical Recording Foundation for acting as our fiscal sponsor. I’m very excited about this new project, and look forward to starting on it soon! “The Pytheas Center for Contemporary Music is a wide ranging web nexus for contemporary concert music. Our mission is to promote contemporary composers and their music through information, understanding and performances. I also have another video link to share. This time, its to a beautiful piece of fabric art by Ke-Sook Lee, called Green Hammock. Scott Anderson created the video, and used an excerpt from my Walk through “Resonant Landscape” No. 2 as the sound track. Enjoy! TRACES ON THE FARTHER SIDE (2011), a music visualization in real time, seeks visual expression for the delicacy and otherworldliness of Frances White’s A FLOWER ON THE FARTHER SIDE (2010), whose inspiration in turn lies in a chant by the medieval mystic, Hildegard of Bingen. TRACES assigns each of the four viols and the prerecorded track of wind sounds and viol chords to its own panel, where they generate colored marks according to the characteristics of their unfolding sound. The prerecorded line in the middle panel keeps within its bounds with the stability of a cantus firmus, whereas the four viols are given the freedom to interact unpredictably, simulating the communicative nods and glances of PARTHENIA’s musicians as they play. No two runs of the app for TRACES can be exactly the same, and so the final frames of this programmed creation have the individuality of handmade works of art. Welcome to my new website! I’m very excited about it. I hope it will be much easier to explore, and much easier to find music! I will be adding more audio clips on the Music page soon, and I will be making all my scores available for purchase on the Recordings and scores page. 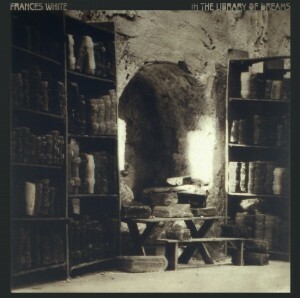 I’m also very excited about my new CD In the library of dreams, available from Pogus Productions. It features magnificent performances by Ralph Samuelson, eighth blackbird, David Cerutti, Liuh-Wen Ting, and Thomas Buckner, and gorgeous cover art by Lothar Osterburg. For more information and orders, please visit the Pogus website. I am working on an exciting collaboration with the viol consort Parthenia, librettist/producer Wendy Steiner, and architect/computer visualization specialist Andy Lucia. In this project, called Traces on the Farther Side, the music of my piece A flower on the farther side (commissioned by the Fromm Foundation for Parthenia) will trigger mysterious and beautiful visual tracks, in both live performance and as DVD installation. Traces on the Farther Side will be performed this October at Picture Ray Studio in NYC.